The Saint Anthony festival (Santo Antonio) brings a wonderful atmosphere to the city of Lisbon! Streets in the city of light are decorated with garlands and lights, filled with people dancing, singing and eating sardines. 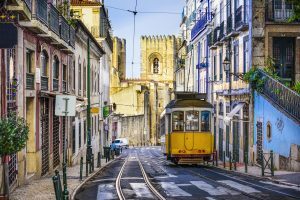 On this tour, you get to experience it all, while you learn more about Portugal’s history visiting several towns and sites. Your last night you will wrap up this wonderful trip with the ultimate Portuguese tradition in Lisbon: a Fado dinner. Definitely a trip that will be remembered and cherished for years! Six nights stay at centrally located four star hotel. Single Supplement is an additional $600. Deposit of $500 per person is due to book the tour and Full payment is due 60 days prior before departure. 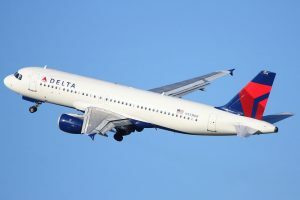 The evening departure is aboard Delta Airlines for your transatlantic overnight flight to Lisbon. Dinner will be served onboard accompanied by a selection of Portuguese wines to complement your meal. You will arrive in the early morning at Lisbon Airport. After clearing customs, you will be transferred to your hotel in Lisbon. Spend the day at leisure, then meet the rest of the group for dinner at the hotel before heading to the Santo Antonio festivities. In the afternoon we make our way to the Se cathedral for another parade, followed by another evening celebrating the Santo Antonio feast! Today you will have a half day tour, exploring the idyllic town of Sintra. 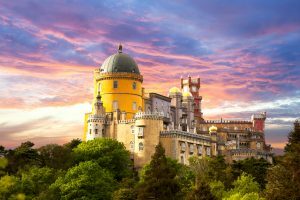 In Sintra, you will be able to visit the famous Palacio de Pena, a romanticist castle, above the village. The castle has excellent views, of Lisbon and the sea. After visiting the castle, you will have time to visit the village of Sintra, before returning to your hotel. Today you will have a half day afternoon tour in Portugal’s capital city. 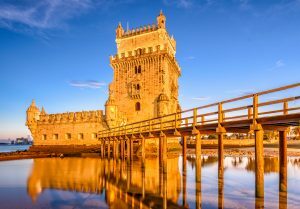 The tour begins in the Belém area where you will visit the Belém tower, the ceremonial gateway to Lisbon. Your next visit is to the Jerónimos Monastery, where the famous Portuguese explorer Vasco da Gama is laid to rest, and a final visit to the Coaches Museum, where you will be able to see the horse drawn carriages from the Royal House of Portugal. You will be able to sample the "Pasteis de Belém", Portuguese pastries. The tour then continues onto the Alfama, Lisbon’s oldest quarter, where fado music is heard at night, before we return to the hotel. After the tour you will once again enjoy the Santo Antonio festivities! 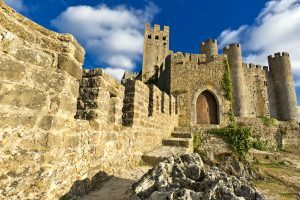 We begin the day by heading north visiting the historical landmark of Óbidos, a town known for its medieval castle and walls. 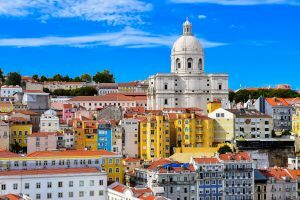 Following our visit, we head to the fishing village of Nazaré, a town split into two neighborhoods, the long sandy beach, and the town set on a high cliff, overlooking the sea. Lunch will be served in a local restaurant in Nazaré. Following lunch, we continue onto Fátima, the site where the Virgin Mary visited the three little shepherds. We arrive in Fátima in the afternoon, where we will visit the sanctuary, churches, and the three shepherds’ home. We arrive back in Lisbon in the early evening. Today the day will be at your leisure. Fado Dinner. Today you say goodbye to Lisbon. We hope that on the flight back you reminisce of the good times that you had on the trip. The above price is per person based on double occupancy. A deposit of $600.00 per person is due to book the tour, and full payment is due 45 days prior to departure.